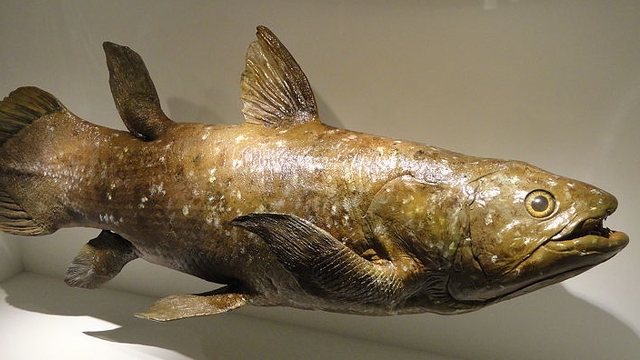 The African coelacanth (Latimeria chalumnae) was thought to have gone extinct around 70 million years ago until a fisherman caught one off the coast of the South Africa in 1938. The fish looked so much like its fossilized ancestors of 300 million years ago that it was labeled a “living fossil.” That’s a controversial term, as looks can be deceiving but parts of the coelacanth’s genome do appear to be changing more slowly than those of other vertebrates. Having acquired DNA from a rare fresh-caught specimen, an international team of researchers sequenced the whole coelacanth genome, revealing surprisingly little change in the fish’s protein-coding genes, as compared with a chicken and several mammals. The reason for this plodding rate of change is not clear, but the researchers suggest that the coelacanth’s unchanging deep-sea habitat and lack of predation over millions of years may have reduced the need for adaptation. Although comparative analysis showed that the lungfish, rather than the coelacanth, is the closest living relative of tetrapods, the findings could also shed light on the genetic basis for how fish first adapted to life on land. Like the lungfish, the coelacanth has 4 lobed fins, which the fossil record shows gradually transformed into the limbs of modern tetrapods. By comparing the coelacanth genome to those of four-legged vertebrates, the researchers isolated a chunk of regulatory DNA shared by the two groups of animals, but not by fish without lobed fins. When the sequence was inserted into a mouse embryo, it drove the expression of a cluster of genes associated with the formation of bones in wrists, ankles, fingers, and toes. The function of the genes in coelocanths is not clear, but the findings suggest that they likely played an important role in the formation of the limbs on which a fishlike creature first crawled onto land millions of years ago. C.T. Amemiya et al., “The African coelacanth genome provides insights into tetrapod evolution,” Nature, 496: 311-16, 2013. 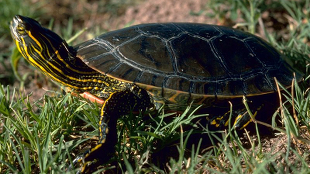 The most widespread native turtle in North America, the Western painted turtle (Chrysemys picta bellii) is probably best known for the psychedelic red and yellow markings on the underside of its shell. But it also boasts some extraordinary physiological traits, not least the ability to stop breathing and survive near-frozen while it hibernates in ice-covered ponds, only to wake up and plod off after it thaws in early spring. And because similar genes are present in humans, the researchers speculate that regulatory pathways in the turtle might help identify therapeutic targets for hypoxia-induced tissue damage in victims of heart attacks or stroke. J. Abramyan et al., “The western painted turtle genome, a model for the evolution of extreme physiological adaptations in a slowly evolving lineage,” Genome Biology, 14: R28, 2013. 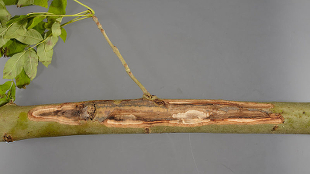 A disease known as ash dieback, caused by the fungal pathogen Chalara fraxinea, has devastated ash trees across Europe over the past 20 years. Denmark has lost 60–90 percent of its ash trees to the disease, which reached the United Kingdom in October 2012. In response, UK scientists have sequenced the genome of the fungus and the transcriptomes of several samples from infected trees—and taken the unusual step of publishing the data online before they have completed their own analysis, in order to open up and speed the process of interpretation. It’s early days, but collaborator Sophien Kamoun of The Sainsbury Laboratory in Norwich, UK, told BBC News that the team has already isolated some toxin genes and “additional genes that could be contributing the virulence of the fungus, that are worth studying.” Meanwhile, UK and Danish researchers are collaborating to analyze the genetic characteristics of two trees in Denmark—known as tree 35 and tree 18—that boast high levels of resistance to the disease, reported The Daily Telegraph. The plan is to identify trees with similar genes and begin breeding resistant saplings. D. MacLean et al., “Crowdsourcing genomic analyses of ash and ash dieback—power to the people,” GigaScience, 2: 2, 2013. 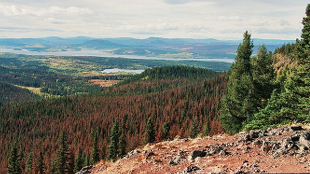 Roughly the size as a grain of rice, the mountain pine beetle (Dendroctonus ponderosae Hopkins) has laid waste to huge swaths of pine forest across western North America. The beetles live under the tree’s bark, where their larvae and a fungus they carry combine to block water and nutrient transport, choking the life out of the tree in a matter of weeks. At normal population levels, the beetle kills only weakened trees, but in recent years, hot dry summers have brought epidemics and the infestation of millions of acres of pine forest. To find out more about the molecular mechanisms underlying this pest’s destructive abilities, Canadian researchers have sequenced its genome and several transcriptomes. The data reveal relatively large variations in the DNA sequences of individuals from different locations, which may help them to overcome various defensive compounds as they expand into areas with different pine species. The researchers also isolated clusters of genes coding for enzymes that detoxify the trees’ defensive compounds, as well as those that break down plant cell walls. The areas in which these gene families have changed compared with related beetle species could indicate exactly what makes Dendroctonus such a devastating pest. The genome also contains an enzyme-coding sequence that appears to have been acquired from bacteria known to be associated with the beetle. This gene family was only expressed in the digestive tissue, suggesting it may have been acquired to facilitate the utilization of host pine carbohydrates. 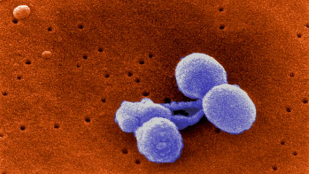 Streptococcus pneumonia resides in many people’s respiratory passages and although usually harmless, it can sometimes lead to pneumonia and meningitis. The incidence of such illnesses in young people in the United States has fallen off dramatically since 2000, when vaccines were introduced—though serotypes of the bacteria that are not targeted by the vaccine have rapidly increased. To better understand the bacterial response to this vaccine, researchers sequenced the whole genomes of 616 clinical samples of S. pneumoniae isolated from children who carried the bacteria but did not get sick. The samples were collected in Massachusetts between 2001 and 2007, during the roll out of the polysaccharide-protein conjugate vaccine “Prevnar,” which protects against the seven strains of the bacteria most commonly associated with disease. The team found that the incidence of disease upon infection had decreased, even though the genetic composition of the bacteria at the population level was largely unchanged. Specifically, while the serotypes targeted by the vaccine all but disappeared, and pre-existing types moved in to fill the void, the genomes of these strains are virtually identical—except for a few key genes. The results led the researchers to conclude that only a few genetic alterations are responsible for the large reduction in the rates of pneumococcal disease. N.J. Croucher et al., “Population genomics of post-vaccine changes in pneumococcal epidemiology,” Nature Genetics, doi:10.1038/ng.2625, 2013.